Welcome to the latest in what has become a tradition of disclosure posts after major events where vendors attempt to sway my opinion with gifts of dubious usefulness. This one covers VMworld US 2015, and I’m also including vExpert type schwag that is organised to be delivered around the time of VMworld. I deliberately avoided taking a lot of schwag this year because a) I don’t need more t-shirts, and b) I already have more battery packs than I can use. As I now re-read this post after writing it, I shudder to think how much stuff I’d have accumulated if I wasn’t avoiding loads of schwag. Some people must have had really heavy bags coming back. I paid my own way to the show this year, with the exception of my hotel room, which was paid for by the Tech Field Day folks. This got me a small room without air-conditioning, but at a hotel (The Mosser) an easy walk from the Moscone Center, which was totally worth it. Technically I also paid for some of my hotel, because I have some bogus charges on my credit card that I now need to sort out, but that’s what disputed charges are for. There is a lot of socialising and meeting at VMworld, often over food and drinks. I arrived Saturday, and bought my own lunch at the excellent Fresh Rolls at the Metreon near Moscone. Early in the evening after getting settled into my hotel, I had a couple of beers with friends (paid for myself/ourselves) at the Marriott hotel and checked out the view from the top floor. Well worth a look if you’re around. Dinner and drinks were courtesy of Trevor Pott’s vGravity event, which was paid for by Catalogic Software. Sunday breakfast was just coffee at the hotel. I got distracted by email and other things and forgot to grab lunch before #v0dgeball, so after that I shared some hot chips and an adult beverage with friends from HDS, who kindly picked up the tab. Dinner was with the same small group, and I tried the local seafood gumbo and a ginger beer. Both were tasty, and again HDS kindly paid. I had a couple of beers at VMunderground, an ice-cream ball-on-a-stick thing, and two cookies, before turning in relatively early so I was decently rested for the rest of the week. Monday was the first major day, and I had breakfast courtesy of Pernix Data. A simple coffee and eggs affair. Lunch was the VMworld supplied box lunch at Moscone West. Dinner was snack-type food and local wine at the Battery Ventures event at Press Club, where I got to meet Adrian Cockcroft, who was gracious and lovely. My thanks to Brian Gracely for making the introduction. I stopped in at the VMturbo party with the vLadies to say hello to people and had a gin and tonic. Tuesday I skipped breakfast in favour of a little extra sleep, which proved to be a good trade-off. Just before lunch I had half a mimosa thanks to the lovely ladies of the #CurrentStatus podcast. Lunch was courtesy of Tech Field Day, as I was at the Tech Field Day Extra event on Tuesday. Some nice roast chicken and vegetables from somewhere local paired with Diet Coke. There was pie, but I had a cookie instead. Dinner was finger food at the Highland Capital event at the W Hotel and local wine. I then stopped in at the Tintri customer party at Ruby Skye, and they had some sort of baseball them going on. Thankfully this included some hot dogs because I hadn’t had enough to eat given all the running around I did that day. I also had a pretzel, and a couple of gin and tonics. Wednesday I skipped breakfast because I had an early-mid-morning coffee meeting with vArmour, and unfortunately only had coffee because of time constraints. I was ravenous by lunchtime. Lunch was build-your-own burger courtesy of Solidfire, which was much needed by that stage due to skipping breakfast and no time for grabbing a snack. Dinner was courtesy of Tech Field Day because I was in no mood for the mass crowds of the VMware party. Another burger because I wasn’t up for making more complex decisions by this stage, and a single margerita that I didn’t finish because it wasn’t very good. After dinner I had a chat with some colleagues and had two glasses of local wine. Thursday was a glorious sleep in until 8am, then pack, check out of the hotel, and get to the final keynote. Lunch was Sushi Boat on Geary Street, which I paid for myself. It was tasty, but no better than what we have in Melbourne. We are a bit spoiled for quality food here. CohoData gave me a t-shirt, a plastic water-bottle with built-in straw, an impractically car-shaped pen, a car-shaped bottle-opener, a weird badge thing, a USB to mini-USB/micro-USB/Thunderbolt converter, and a sticker. I assume the car theme is something to do with speed. The sticker has been added to my laptop. DataGravity gave me a vExpert branded golf shirt, which arrived at home while I was at VMworld, so a pity about the timing there. EVO:RAIL threw a cap at me, and I grabbed some stickers, one of which is on my laptop. The cap will go into the cap drawer because my wife says I’m not allowed to wear baseball caps. Github gave me some of their cat/octopus character stickers (one is now on my laptop) and a tiny guide to Markdown that will be quite useful. An In Tech We Trust podcast sticker. Pernix Data gave me a Cocoon Grid-It thing, which is elasticised webbing on a tablet shaped stiff board. It seems like it’d be useful, but also a bit of a gimmick at the same time. 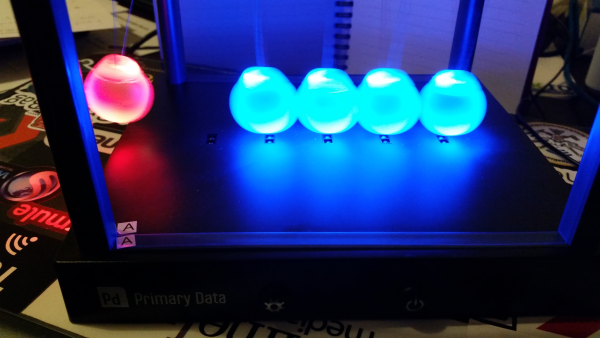 Primary Data gave Tech Field Day delegates a Newton’s cradle that has LED lights in it. It takes six (6!) AA batteries, which I’ve borrowed from my label maker to test it out. Sadly it’s not as well aligned as the metal ones, so it tends to stop quickly. Rubrik kindly gave me one of their LEGO minifigs, which my son has immediately turned into some sort of Avengers (or possibly Batman, it depends) character. 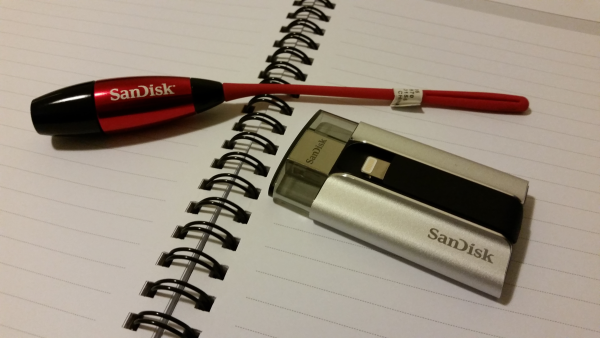 SanDisk once again gave the Tech Field Day delegates a bunch of SanDisk products: an iXpand Flash Drive (32GB), a Cruzer Force 16GB USB thumbdrive (which is tiny, even smaller than the one I got from X-IO Storage a while ago), and the little keychain style light in the photo above. The tail on it feels uncomfortably like the tail of a live mouse. SimpliVity gave me a vExpert 2015 branded hoodie, which is very nice. I’m wearing it as I type this. I also grabbed some mints from their stand because I forgot to pack throat drops and they may well have saved my voice. I grabbed some Solidfire socks based on how nice the ones from last year were. Sadly I think I grabbed Large when I should have grabbed Medium, as they’re not quite as comfy. Tintri gave me a vExpert branded golf shirt earlier in the year. I also grabbed some CrackerJack and Animal Crackers from their party for my son. Oh, and a lollipop. I grabbed a Reduxio pen which writes quite smoothly and is very light, so ideal for travelling with. It’s blue ink though, not black, and I tend to prefer black ink for some reason I’m not totally conscious of. The vBrownbag folks gave me a sticker and two metal luggage tags. The luggage tags look like they’ll survive a lot of travel better than the plastic tag things I have from Qantas. The same VMworld 2015 bag everyone else got, containing a VMworld 2015 t-shirt and a notebook, and a Veeam branded plastic drink bottle that I don’t trust not to leak. Last year’s VMworld 2014 aluminium bottle will remain my travel bottle of choice. It’s quite a lot when you write it all down like that, isn’t it? This is why I think it’s important that I do this sort of post, because otherwise it’s easy to forget all the little bit and pieces individually. As always, if I’ve missed anything, or any of this needs clarification, do let me know.